There is a SKUNK family that lives under our next door neighbour's shed. The shed is adjacent to our fence, and it really PISSES ME OFF! One SKUNKIE a looooong time ago farted ON me when I saw him on the street can you believe it?? How extremely rude. (mum: it was 2am! Skunks are every where in the city. They know when garbage day is and they come out and roam the streets.) I never forgot about the rudeness. Nowadays, I get very very mad when I come across one, but I always make sure to threaten from outside their shooting range (I run big circles around them while snarling). This SKUNK family comes back every year to have babies, and they have 3-4 babies every year! Stooopid STINKY got sprayed in our own yard few months ago when the SKUNKIE came over from under the fence. He was drooling and foaming at the mouf like crazy, and he kept coming up to me trying to get comfort. I kept running AWAY from him! I was in the yard too, and I barked and growled but stayed way way away. That happened to Tosca too, didn't it? Oh we can only imagine how stinky that would have been. Stinky would call YOU stinky! 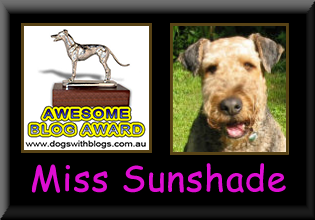 We can't believe that a skunk would have the audacity to fart on Miss Sunshade! How dare he! We can't see your video, Sunshade. It's set to private. Stinky is as stinky does, I suppose. Those skunks are really full of themselves. We had a couple doing the nasty right in our yard and they totally ignored me when I tried to roust them (get a room!). Sunshade,your brother sounds a lot like Booberdog :)I don't know how many times over the past few years we've gotten sprayed because Booberdog thinks she can catch a skunk...peeyou!! OMG, you're taking down the fence, Sunshade! You really don't like those nasty skunkies, do you! Just watched the video...were you trying to eat the fence?! We were very impressed with all the big balls floating around in your yard. I can see you were really mad about those skunks! And a big collection of balls too! Hi Sunshade, I've not had the plesure of smelling Shunk fart! it must be one hell of a smell. Funny video by the way.